Travelling Nova Scotia without a car can be difficult. The province’s small and spread out population means the public transport system isn’t as developed as in many parts of Europe and Asia. You can use buses to travel between many of Nova Scotia’s towns and cities. The train can occasionally be useful but services are limited. Ferries welcome foot passengers but you may need to take a taxi from the nearest town to the terminal. In Halifax, there are local buses and ferries as well as shuttle services between the capital city and major towns. 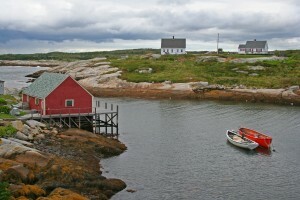 Getting to Nova Scotia’s rural areas is more of a challenge. Consider taking a tour, if you don’t have a car and don’t want to rent one. Otherwise you’ll miss many of the province’s best attractions. If you enjoy active holidays, why not go by bicycle on Nova Scotia’s many quiet roads? Some people also enjoy hitchhiking. Experienced hitchhikers say it’s relatively easy in Nova Scotia because of the friendly people and relaxed nature of the province. There are safety risks to consider and you may wait a long time for a ride in rural areas.